Hidden New Jersey: Cheap gas... mall shopping... and a duel? New Yorkers flock to current day New Jersey for cheap gasoline and tax-free clothing shopping, but in the early days of the United States, they had another reason for crossing the river: settling disputes. 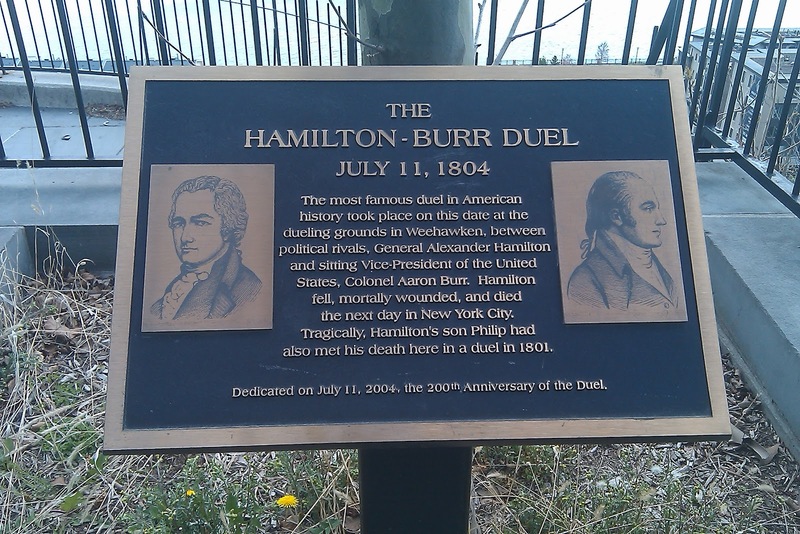 At the time, dueling was a socially accepted means of resolving a grudge, but laws against the practice in New York were severe and strictly enforced. New Jersey, however, was a bit less meticulous about stopping duels and punishing the participants. Even New York Governor DeWitt Clinton is said to have taken advantage of the site to settle a disagreement. The cliffs of Weehawken were a favored spot for duelers -- they were close to the river for quick arrival and exit, and the surrounding brush and trees offered some cover. 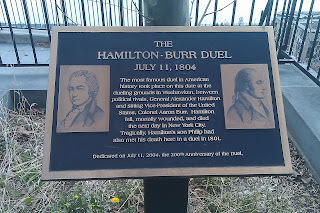 Today the bluff above the then-popular site is marked to denote the tragic 1804 duel that took the life of Treasury Secretary Alexander Hamilton while plunging Vice President Aaron Burr into infamy. A bust of Hamilton commemorates the event not far from where it occurred, accompanied by a stone on which his head was allegedly laid after he was mortally wounded. What few people know is that Hamilton's son Phillip died by similar circumstances, not far away, three years earlier. Viewed by his father to be the family's "brightest hope," the 20-year-old was being groomed as a successor to continue on the family work in government and politics. Thus, it wasn't surprising that Phillip took umbrage at insults he perceived in an 1801 Independence Day speech by a young Republican lawyer named George Eaker. Words were exchanged, Eaker called the young Hamilton a rascal -- fighting words in that day. A duel was arranged shortly after. According to the recent biography written by Ron Chernow, the elder Hamilton was torn when he heard of the impending clash. While having moral objections to dueling, he still felt it important to defend one's honor and integrity when insulted. He counseled Phillip to either hold fire or shoot in a direction away from Eaker. That way, if he were shot by his opponent, it would be considered murder. It was a very similar strategy to the one Hamilton would use in his own duel with Burr three years later. Sadly for all involved, the strategy worked about as well for Phillip as it would for his father. Meeting his opponent at Paulus Hook in Jersey City, he held fire and calmly took the shot Eaker discharged. He died the following morning, attended by his grieving parents. You'd think the experience would have served as a lesson for Hamilton in his dealings with Burr, but his inability to see the futility of dueling would cost him his life, as well.